Marcos began his double bass studies with Uruguayan professor Milton Romay Masciadri (1931-2009), former principal bassist of the Porto Alegre Symphony Orchestra in Porto Alegre, Brazil. He later moved to the U.S. and studied with Masciadri’s son at the University of Georgia, Dr. Milton Walter Masciadri. He completed a Doctor of Musical Arts (D.M.A.) degree in Music Performance from the University of Illinois at Urbana-Champaign under the direction of Professor Michael Cameron. Marcos performing along with fellow virtuosi Catalin Rotaru. 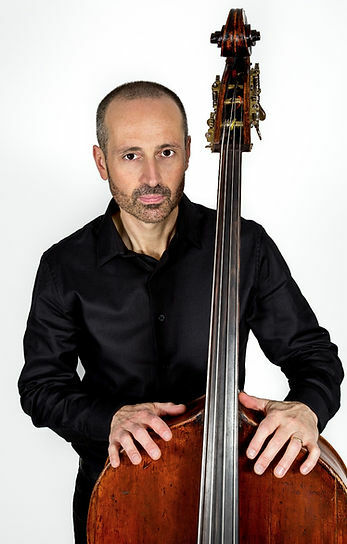 Machado’s versatility on the double bass and captivating stage presence has inspired many composers to write works for the double bass dedicated to him. Recently, he gave the world premiere performance of Arthur Barbosa’s Concerto for Double Bass and Orchestra which was written for Machado, the world premiere of Frank Proto’s Partita for Solo Double Bass at the International Society of Bassists Convention in San Francisco, CA, and the South American premieres of Frank Proto’s Concertos: A Carmen Fantasy and Nine Variants on Paganini for double bass and orchestra. Here’s a beautiful track off his album Metamorfora. Dr. Machado maintains an active performing and teaching schedule, touring the USA, Europe and South America. Associate Professor of double bass at The University of Southern Mississippi since 2005. He is also the director of the Southern Miss Bass Symposium. In South Brazil, he is the founder and pedagogic director of the Pampa International Music Festival (FIMP Bagé). While on sabbatical in 2014, Machado worked on a book of technique, “Tao of Bass,” and this CD, Metamorfora, with Brazilian pianist Ney Fialkow. In 2014 he was also artist-in-residence at the Conservatório Nacional de Música de Lima in Peru. Marcos Machado performs on a David Tecchler double bass, c. 1700 and uses a Boris Fritsch bow. Here’s a great interview with Marcos on Jason Heath’s amazing podcast Contrabass Conversations. For more info check out these links. Also find Marcos on his Facebook page where he posts daily performances of his book excerpts and more. JOHNNY HAMIL wanted to post on here that Marcos and he met at George Vance bass workshops in Washington D.C. at some of the first events. George’s workshops and philosophy are the core of the KCBASS mission (also it’s dedicated to the Memory of George).This is also of course connected to our Maestro Francois Rabbath. There are many stories Johnny would like to tell you about Marcos wonderful person and his amazing musicianship but, he really just wanted everyone to know how much Marcos works to make George’s message of showing all bass players the beauty of the great bass family we have around the world. We are thrilled to have Marcos come to KCBASS! Everyone is in for a real treat.